Why is the pentagon, like the rest of America, sucked into this agenda? Americans don't really care what someone does in the privacy of their own home. We don't want to know. Don't hurt anyone, don't break the law and the rest is between you and your God. But when homosexuality becomes rampant, when it goes from their house to the White House...we do care. We do say ENOUGH IS ENOUGH. But folks, welcome to the new America. Welcome to the fundamentally changed Military. Welcome to an America that 90% of us don't want but is being forced upon us through court decisions and illegal Presidents. America, we will reap what we sow. May He give us ears to hear. -W.E. But the event failed to include any mention, pro or con, of the most celebrated homosexual soldier in American history, Bradley Manning, who is currently on trial for treason. Repeal of “Don’t Ask, Don’t Tell” was passed by Congress in a lame duck session and three weeks later signed into law by Obama on December 22, 2010. It was all done in a hurry, before the full ramifications of the WikiLeaks treason case and Manning’s role in it were known. 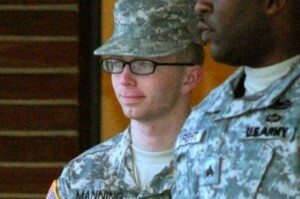 At this point, it cannot be said with certainty that Manning did not have other gay collaborators in the ranks of the Obama Administration.